Sanjeev is on a high right now. The Tamil actor has just netted the Best Actor Award in the recently concluded Sun Kudumba Viruthugal. He's also playing several interesting characters on television and anchoring Tamil TV's most popular dance show to boot. The man is charm personified, and keeps viewers glued before the TV in every avatar: actor, anchor, and all-round fun-guy. First off, congratulations on the Best Actor Award. How does it feel to win it? I'm on top of the world. It feels great to win this award, because this is the first year of its inception, and the people have selected the winner by casting their votes. It's an honour to know that they like my work. I won it for the serial Thirumathi Selvam, which has a very innovative storyline and a strong cast. I play this guy who's basically quite meek. It's hard to rouse him to aggression, and so far, he's been unaware that his family's been working against him. Now, he's begun to understand, and show his true colours. What other serials do you work in, aside from Thirumathi Selvam? I'm a part of the serials Vilakku Vecha Nerathulae, and Idhayam. In the latter, I have a unique role. I'm called Valmiki, and I play this Robin Hood kind of character who helps poor people. Of course, he has other motivations as well, like revenge, but that becomes obvious only later. In Vilakku Vecha Nerathulae too, I play a guy who's in love with the heroine. I assume she returns my feelings too, but she doesn't. He believes it, though, because situations crop up that make it seem true. Let's see how things are going to shape up. How did you end up in the world of television? I come from a family that's been involved in TV and films. My aunt is actress Manjula Vijaykumar; I was exposed to the media from a very young age. My sister Sindhu was a television actress as well. In the aftermath of the tsunami disaster, she went along with a few other media artists to collect funds as part of a media initiative. She had a bad asthma attack and passed away. She'd been acting in the serial Metti Oli, and its director Thirumurugan called me up about a role. 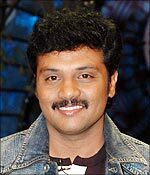 The character was called Ilango, and it was a pretty small role. But he liked the way I played it, and developed it. That was in 2002, and that was my break. I can say with certainty that Thirumurugan discovered me, and director C J Bhaskar shaped me. Actor Vijay and I were classmates, and I've been in a few of his films like Badri, Nilave Va, Pudhiya Geethai and others. I've even acted alongside Sivaji Ganesan in Poo Parikka Varugirom. Aside from acting, you're an anchor for Manada Mayilada as well. What's that experience like? Exhilarating. Manada Mayilada (MM) was an unexpected bonanza in so many ways. When Kala Master first developed the show, she roped me in, saying that this was her first time on television and she needed my help to get the team together. The first season's teams were entirely my effort; I spoke to everyone, got them together. That's when Kala Master suggested that since I was so much a part of the show, why don't I anchor it as well? That's how my journey with Keerthi as co-anchor started. She's a darling, and my very good friend. We gel very well, together. You have the reputation of being a very fast talker. Some of your spitfire speeches are very popular on the show. Care to elaborate? Oh, that was entirely accidental. You see, we were wrapping up an episode of MM and Kala master was yelling at everyone to finish things very quickly, because we were running out of time. I looked at my script, and because of the time constraints, I spoke everything at break-neck speed. That caught on, and became a sort of USP for the show. Now it's a conscious effort! I have quite a few movie projects lined up. They're in the planning stage, and I'm quite excited about them. I'm very busy on television as well, and I don't want to give that up. It's been great so far, and frankly, at this point, I have no clue what my future's going to be [laughs]. I'm doing what I like, the way I like it. God is there. I believe in thinking positive  and that good things will continue to happen. Catch Manada Mayilada on Sundays on Kalaignar TV, at 7.30 pm.